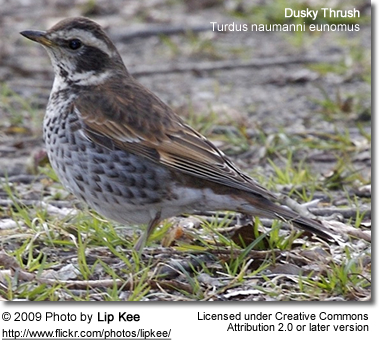 The Dusky Thrush (Turdus naumanni) is a member of the thrush family Turdidae which breeds eastwards from central Siberia. This species breeds in open woodland areas; The northern form, as would be expected, is more tolerant of mountainous and tundra-edge habitats. 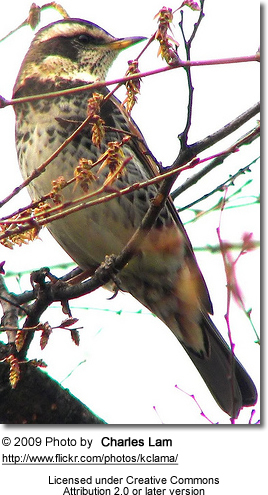 This species is strongly migratory, wintering south to southeast Asia, principally in China and neighbouring countries. Both subspecies are rare vagrants to western Europe. The scientific name of this bird commemorates the German naturalist Johann Andreas Naumann. It nests in trees, laying 3-5 eggs in an untidy but neatly lined nest. Migrating birds and wintering birds often form small flocks. It is omnivorous, eating a wide range of insects, especially mosquitoes, earthworms and berries. 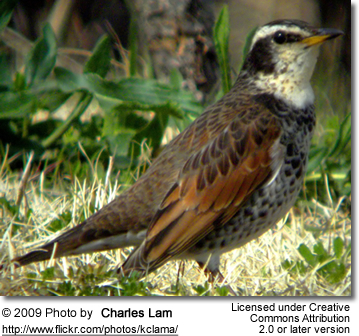 This is a medium-sized but stocky thrush, reminiscent in structure of a small Fieldfare. The underwing is reddish brown, and there is a pale supercilium (line above eye). 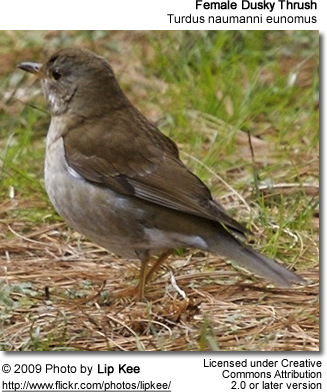 The Naumann's Thrush has pale brown back and head. The face, breast, flank spots and rump are reddish, and the belly and undertail are white. T. n. eunomus has a darker brown back and rump, and the face, breast, and flank spots rump are black. The belly and undertail are white. The females of both forms are fairly similar to the respective males, but immatures have a weaker patterning. 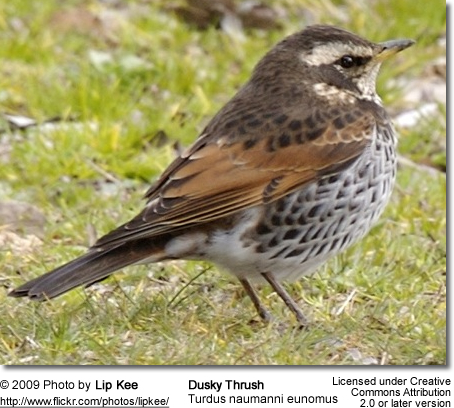 The male Dusky Thrush has a simple fluted or whistling song, similar to the Redwing. There are suggestions that there are geographical variations in the vocalisations.